Buarawong Hotel - The northern hospitality.The floral charm of Chiang Mai in the heart of the city. 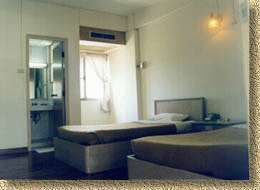 The central hotel of choice for tourists as well as businessmen. BUARAWONG - The warmest 'welcome' of the northern hospitality. The floral charm of Chiang Mai in the heart of the city. Situated a few hundred meters from the heart of the Night Bazaar (Chiang Mai shopping and entertainment area), BUARAWONG is the central hotel of choice for tourists as well as businessmen. With direct access to ChangKlan Road and the hot spots of Chiang Mai, the transportation by 'Tuk-Tuk'(local taxi) is easy. Just step out of your room and you are sure to catch a taxi. The staff at the hotel desk. Overseas Facsimile Service at the hotel desk and a Conference Room are the pluses that fully meet the businessmen's needs. 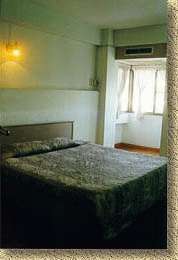 With economical rates and monthly rates, BUARAWONG is an hotel of choice for short - and long term budget minded visitors. Rates in Thai Baht valid all year round. INCLUDED: TV, Fridge, Bed Set, Towel. Cleaning EVERY DAY (Daily and Monthly Rate) INCLUDED: Airport Transfer by Limousine Service American Breakfast included in Daily Rate only Electricity not included in Monthly Rate: THB 7.- per unit. (Payment of first month rent plus security deposit). Please note: Deposit refund: Check-out must be notified 15 days in advance. You can book your room right now, online! Just fill in the forms below and click!... within two business days, we'll send you an e-mail to confirm your reservation.